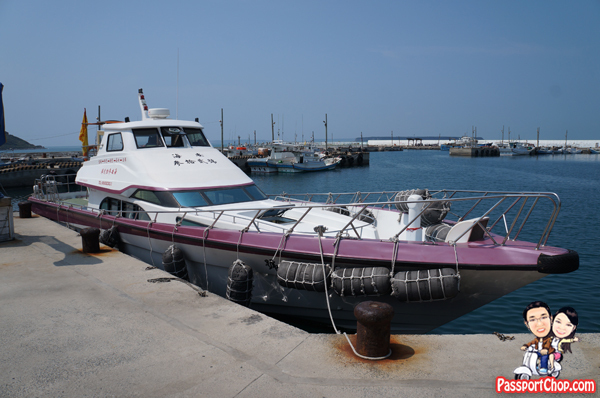 Having spent the last 2 days seeing the North Islands – Jibei, its sea sports and the signature sand spit and done a horseshoe tour around the Penghu main islands, our 3rd day itinerary at Penghu is island-hopping at the South Sea Islands: Qimei (七美嶼), Wang-an (望安嶼), Hujing (虎井嶼), Tongpan (桶盤嶼). 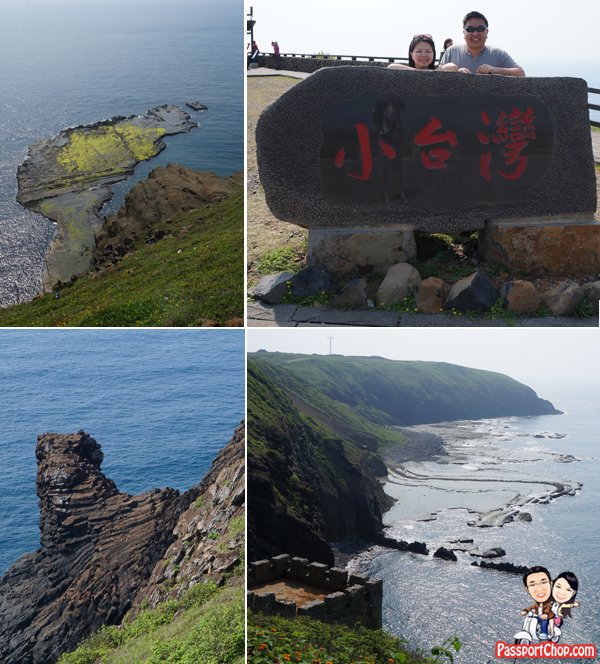 These islands (嶼) are where you will see most of the beautiful scenery and rock formations found in most Penghu postcards e.g. basalt formations and of course the iconic Twin Hearts Weir (雙心石滬). The South Sea Island-Hopping tour starts at the 南海遊客中心 South Sea Visitor Centre (where we took our boat to the Marine Leisure Farm青灣海洋牧場巡禮 the day before). There are a number of cruise/tour companies that offer a trip to the South Sea islands and you can choose to visit one to four of the islands. For the four South Sea island cruise/tour (南海四島), expect to start your day early (the boat will depart at about 7-8 am) and the whole trip will take about 7-8 hours. For our South Sea Island-Hopping trip, we went with the 4-island covering 七美、望安、虎井、桶盤. The trip with 海安遊艇 cost 950 NT (inclusive of NT 2 million insurance coverage). Of course, bring camera to capture the beautiful scenery at the islands! The journey started with a 70-minute cruise to the farthest of the 4 islands – Qimei 七美 – in our South Sea island-hopping itinerary. Upon arrival at Qimei island, we were led to waiting tour buses by the jetty for a 1.5-hour tour around the island. If you want to DIY your tour, you can rent a scooter and ride around the island but you should remember to drive back to the jetty before the boat departs for the next part of the itinerary. 七美 literally translated means Seven Beauties. Legend has it that during the Ming Dynasty, a group of pirates came ashore the southern coast of Qimei island. At that time, all the men on the island were out at sea fishing, thus, only the old, the young and the women were left on the island. There were seven ladies who were unfortunately attacked by the pirates. The ladies could not bear such disgrace and committed group suicide by plunging into a well. The well was later filled in with soil by the Qimei inhabitants and left as a tomb for the seven ladies. Seven beautiful lush trees soon grew from the filled well and the area surrounding the well and the trees were designated as the Seven Beauties Chastity Garden or Tomb of the Seven Beauties (七美人塚). Thus, it is not a surprise that our first stop at Qimei island was at the Tomb of the Seven Beauties (七美人塚). There is an entrance fee of NT 30. The tomb (or the trees that grew around the well) is clearly visible from the outside (a low wall separates the paying and the non-paying area). Before we go into the beautiful scenery of Qimei and the rest of the islands in our island-hopping itinerary – let me provide a quick geography lesson on why we are seeing what we are seeing at the islands: The Penghu islands were the result of mass volcanic activity which pushed lava to the surface about 17 million years ago and the lava were then cooled by the surrounding seas to form the various South Sea islands. The islands were subjected to other geological pressures e.g. folding and fault by the active tectonic plates underneath the seas. Erosion by the wind, rain, sun and the sea over many years moulded the volcanic rocks and sedimentary layers of the islands (as well as the islands themselves) to what we see today at the islands. Imagine, visualise – these are the most common words used by our tour guide during our Qimei tour. With imagination, any rock formation can transform into some kind of pattern. Some patterns are much more obvious e.g. Little Taiwan 小台灣 (see picture below) – we can easily make up the shape of Taiwan (an inverted one from our point of view). There are usually observation decks around these rock formations for you to get a good look at the rock formations and spend some time figuring out what they look like. Some rock formations e.g. 望夫石 (or Waiting for Husband Rock) do not have observation decks and the tour guides will try to point them out from the bus – you won’t be able to get off as the bus will drive slowly along a narrow stretch of road and you will have to imagine fast to see what the tour guide wants you to see! Another area at Qimei with such rock formations is the the Great Stone-lion Recreational Area (石獅) – a lion-like formation (see picture below bottom left) that overlooks the Longcheng (Dragon formation) 龍埕 (see picture below bottom right). The name – Longcheng itself suggests what the place must be like. Looking from the observation deck and with some imagination, you can actually see the body, the head and the pearl of the dragon, even the waves splashing against the rock formation can look like the dragon is swimming (try again to take a look at the bottom right picture to see if you can make that out – like i say it requires quite a bit of imagination :-)). Our last attraction stop at Qimei is the iconic “Twin Hearts Stone Weir” (雙心石滬). Stone weirs are man-made structure built by fishermen using basalt and coral reefs as traditional fishing traps. There are a total of 558 stone weirs in Penghu, and up to 88 of them are distributed around Jibei island. 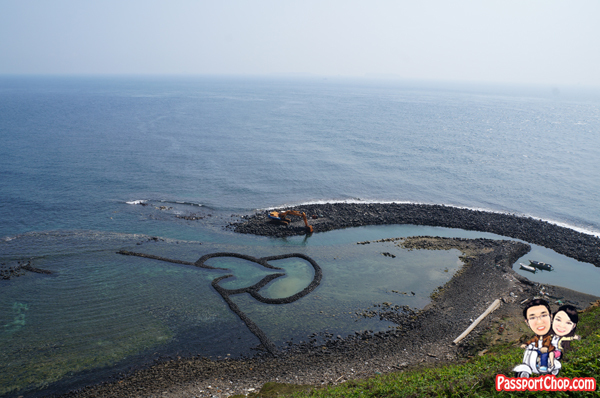 Qimei has only one stone weir but because it is shaped like two interlocking hearts – it has conjured both beautiful and romantic notions among visitors and it is not a surprise that it has been voted as number 1 tourist attraction in Penghu for many consecutive years. Now the Qimei “Twin Hearts Stone Weir” (雙心石滬) no longer catch fish but instead catches the hearts of many tourists to the island. The Qimei twin hearts stone weir is also the most well-preserved stone weir in Penghu. The best period to catch a great view of the 雙心石滬 is during low tide when the two hearts are clearly visible. The boat journey from Qimei to Wang An island is about 30 minutes. Upon arrival, you will have about 2 hours to explore Wang An island on your own (with a rented scooter) or take a bus tour with the ferry operator (included in the price). You should also set some time for lunch at Wang An island – most of the restaurants are just by the jetty so lunch can be the last stop after exploring Wang An island. There are a number of attractions at Wang An island e.g. Tiantai Hill (望安天台山) observation deck and some nice beaches. The island’s highest elevation point, Tiantai Hill, is just 53 meters above sea level. On the western side of the peak is an indentation in the rock (呂洞濱腳印) which is said to be the footprint of Lǚ Dòngbīn (呂洞濱), the leader of the legendary 八仙 Eight Immortals of China (believe it or not). Wang An island is composed of porous basalt with rich deposits of wenshi, or veined stone. The beautiful sandy beaches at Wang An island have earned it the nickname of “Honeymoon Island”. There is also a turtle conservation centre – you won’t find any live turtles there (or at least not for exhibition); it is mainly for education on the importance of protecting marine life such as turtles; Wang An is home to the most stable nesting ground in the Taiwan area for green sea turtles. On the western side of the island, Jhongshe (or Zhongshe or Jungshe – depending on where you are from and how you pronounced it) Village (中社古厝-桂花巷) hosts a number of well-preserved Qing Dynasty houses. This village reminded me of our earlier trip to Erkan Village at Penghu main islands. Originally named “Flower House” 花宅, legend has it that when this village was first established, their ancestors looked at the local terrain, and discovered that the mountains surrounding the place are just like lotus petals. Therefore, they first reclaimed the land around “the heart of the flower” (Shanzaiweiding) and built a house, thus naming it “Flower House”, also meaning the house that was built at the heart of the flower. In 1971, the late president Chiang Ching-kuo visited the flower house, and seeing that it sits in the middle of four other villages in Wangan Township, renamed it “Jhongshe” (the village in the middle). The village is filled with ancient houses that are built of coral reefs. 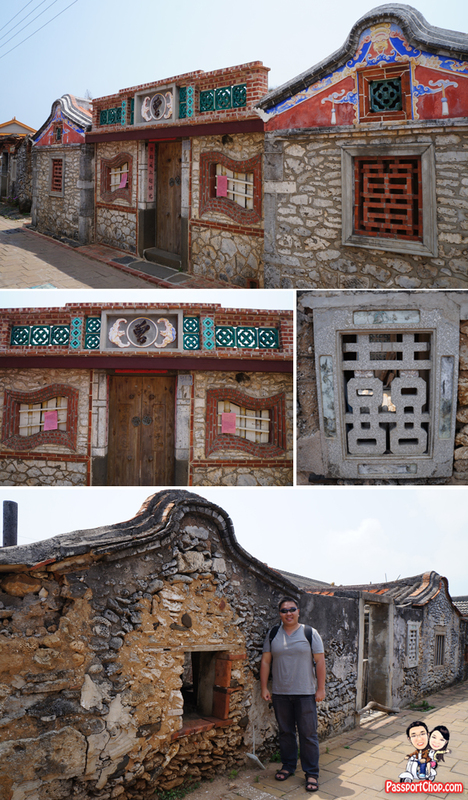 Today, only about 50 San He Yuan (old three-section compound house) are still well-preserved. The architecture style of the historical houses in Jhongshe Village is called “one stamp” style sanheyuan where the main structure should be looked at from the inside to the outside. The Tseng’s Ancient House (曾家古厝) is the biggest and the most luxurious house of the Jhongshe village. It is said that the Tseng brothers were sailors and had earned a handsome sum of money to build the Tseng’s ancient house. You will be able to see the word 曾 built into the window (see picture below)!